The issue of virtual worlds getting on a government’s policy agenda is something we’ve examined pretty closely, and like most of you reading this, it can get frustrating sometimes seeing the pace at which change is occurring. In recent days I was again struck on the world leadership role the United States Government are taking in regards to virtual worlds. This report by Dawn Lim at Nextgov showcases beautifully both the depth and breadth of work going on across a range of US Government departments, including the cross-agency vGov portal which is currently under development. The contrast with Australian government departments is fairly stark. Educators and artists are certainly leading the way, but things get pretty sparse beyond that. In the e-health sphere, there is only limited awareness of the potential of virtual worlds and there’s certainly no active strategy to incorporate them into developing standards. Agencies should support employee-initiated, innovative Government 2.0- based proposals that create, or support, greater engagement and participation with their customers, citizens and/or communities of interest in different aspects of the agency’s work. They should create a culture that gives their staff an opportunity to experiment and develop new opportunities for engagement from their own initiative, rewarding those especially who create new engagement/participation tools or methods that can quickly be absorbed into the mainstream practice that lifts the performance of the department or agency. That’s the open invitation for Australian Government Departments to start innovating, and the US Government example is certainly one worth exploring for its applicability here. In that example, it was the usual story of small groups or individuals advocating for change and driving that change with minimal budget support. Government Departments here obviously don’t have the critical mass that their US counterparts do, but the very nature of virtual worlds means that’s not a significant roadblock. The main barriers still seem to be awareness and a reliance on stereotypes to inform decision-making. 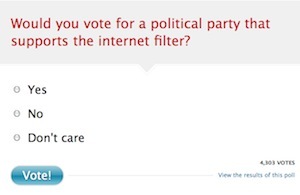 Only those handful of people working within the system will be able to change that, although fighting against short-term political prerogatives isn’t easy at the best of times, let alone in the midst of a heated debate over internet filtering. Over to you: are you aware of governmental initiatives underway that may help in shaping policy agendas in the medium term? There may be no surprise in that to many people, but Tateru’s discovery is that most MMOs have no displayed evidence of having applied for Australian classification. After doing some digging for the story, she believes it’s a case of oversight combined with governmental miscommunication. Personally, I find it hard to believe that the major MMO publishers wouldn’t understand that Australia had a classification regime. The claim is that such publishers were advised in the past that MMOs didn’t need to comply, which is plausible given their nature in comparison to a standard 1-person game at the beginning. Now, MMOs are so widely used it’s a problematic argument to uphold. Behemoths like Blizzard’s World of Warcraft and its expansion packs aren’t labeled with any Australian classification – an unusual thing unless historic advice has been provided to say local classification wasn’t required. WoW in particular has nothing to fear from classification given how innocuous its gameplay is and its well implemented moderation options. It’s more an issue of principle: the government only assesses applications made to it, there’s no proactive work done on ensuring new releases are classified. There’s an obvious problem here – if a less responsible publisher arrives on the scene to release an MMO that would rate R18+ , it can still hit the shelves if that publisher doesn’t apply for classification rather than being refused classification if they did apply. As Tateru mentions in her piece, Australia has the farcical situation of having no R18+ or X18+ categories for games, so everything at that level is refused classification. Add to that the fact that State governments are responsible for enforcing the law and it’s not hard to see how this situation has arisen. Essentially, the current voluntary application process combined with no ‘adult’ games ratings and the old Federal / State blameshifting actually fosters an environment where a non-ethical publisher would be mad not to release their MMO product unclassified. If they’re ever caught (which seems unlikely unless the MMO is beyond the pale), there’s a growing precedent of other MMOs selling tens or hundreds of thousands of locally unclassified copies. I’d have thought that would be one hell of a defense. Hopefully the Australian Attorney General’s department has another look at the issue, particularly the lack of adult game classifications, because the status quo is becoming more untenable as MMOs continue their growth in popularity. The risk is that a crackdown will occur without an expansion of the classification options – that would be nearly as bad as the status quo. 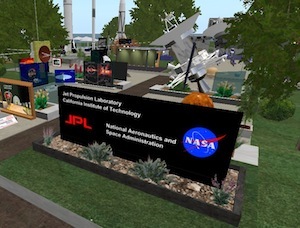 The Federal Consortium for Virtual Worlds is an initiative designed to bring together US Federal Government employees. 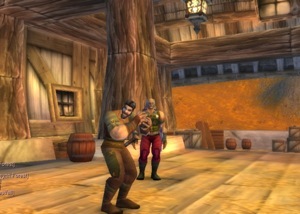 The April 2008 event held by the Consortium shows the depth of discussion at that level in regard to virtual worlds, and the 2009 version is likely to go a step further. This is a body that’s developed through the motivation of public servants from a wide range of fields. When comparing the efforts of the Consortium to local ones, the lack of action by key governmental departments becomes more obvious. The USA experience shows diverse departments like Defence, Energy and Health all examining virtual worlds closely. To be fair, there’s obviously a much greater critical mass of employees in the US, but it still does paint a stark contrast to what’s happening in Australia. The tertiary sector is leading the way with little indication of anyone following at the Federal level aside from independent bodies like the ABC and the Australia Council who’ve invested in some impressive projects. The real risk is that governmental policy in virtual worlds in Australia is driven by the Australian Tax Office and other bodies focused on legislation and regulation. Creating law is a very important part of the evolution of virtual worlds, but a widespread discussion of opportunities is even more important if Australia is to show the level of innovation that the USA is. Do you agree that the Australian government should be taking a more active role, or is this something that should be driven privately whilst the government considers legislation to create some “safeguards”?